The most famous Hunanese dish in the world is General Tso’s chicken. Ironically, it has little to do with the famous general whose name it bears, did not originate in Hunan and is not regularly eaten in Hunan. Peng Chang-kuei was the executive chef for the Nationalist party, who fled to Taiwan after the Chinese civial war. He created the dish during the 1950s, drawing on the flavours of traditioanl Hunan cuisine: heavy, salty, sour and sweet. He took it with him to America when he emigratedin 1973, and with the addition of sugar to suit the Western palate, the dish became an instant hit. Today, it's America's most popular Chinese dish. We wheedled the recipe out of Geoff Haviland, Fresh Catering’s executive chef and the man responsible for creating the Handa Opera on Sydney Harbour: Turandot menu. You can make it at home or try it at the Southern and Northern Terraces during Turandot on Sydney Harbour. General Tso's chicken, prepared and styled by Fresh Catering. Beat the egg whites in a large bowl until broken down and lightly foamy. Add the soy sauce, wine, and whisk to combine. Set aside half the marinade. In a large bowl, whisk together the remaining marinade with the baking soda and corn starch. Add the chicken, mix through, then cover with plastic wrap and set aside. Combine flour, corn starch and baking powder in a large bowl. Whisk until combined. Add the reserved marinade and whisk until mixture has coarse clumps through it. Set aside. Combine soy sauce, wine, vinegar, chicken stock, sugar, sesame oil, and cornstarch in a small bowl and stir with a fork until cornstarch is dissolved and no lumps remain. Set aside. Heat the peanut oil in a heavy based pan over medium heat. Combine garlic, ginger, minced scallions, and red chilies, then add to the pan and saute, stirring, until they become aromatic and soft, but not browned, about 3 minutes. Stir the sauce mixture and add to the pan, making sure to scrape out any sugar or starch that has sunk to the bottom. Cook, stirring, until sauce boils and thickens, about 1 minute. Lift chicken one piece at a time, shake off excess coating, and carefully lower into hot oil (do not drop it). Once all of the chicken is added, cook, agitating with a metal slotted spoon and maintaining a temperature of 180OC, until chicken is cooked through and very crispy, about 4 minutes. Transfer chicken to a paper towel-lined bowl to drain; reserve. Add the chicken pieces to the sauce in the heavy pan, tossing it or stirring with a spoon until all pieces are thoroughly coated. Toss over the sliced scallions. Serve with steamed rice, sweet and sour radish, Szechuan pickled cucumber and Imperial cabbage salad. 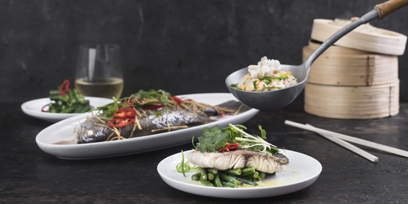 As Fresh Catering's Executive Chef, Geoff Haviland is responsible for creating the Chinese-themed menu for Turandot on Sydney Harbour. If you had to pick one dish from each food outlet at this year's Handa Opera on Sydney Harbour, what would it be? Northern Cantina: Lamb Shank in Master Stock with Red Dates & Woodear Mushrooms; the lamb is slow braised in a rich highly aromatic master stock, flavoured with star anise, dark soy, mandarin and cassia, with the addition of Chinese red dates and local mushrooms, so common in the Northern cuisine. Qantas Garden Bar: Red Braised Pork Belly Bao with Szechuan Pickles & Hoisin Aioli; the tender, melt in your mouth pork belly is sandwiched in a soft steamed bun with salty crispy pickles with a lovely chilli kick at the end; this is the ultimate hawker’s market food. Northern & Southern Terraces: The Black Sesame & Bitter Chocolate Brownie is amazing; the texture and richness with the lovely background flavour of toasted black sesame; this is a Chinese flavoured death by chocolate! The Platinum Club: Steamed Wild Barramundi on Lobster Fried Rice. It has beautiful clean flavours and is perfectly complemented by the black bean beurre blanc; a westernized version of a classic Cantonese dish. What flavours and textures can we expect in the menu for this year's Handa Opera on Sydney Harbour? We've drawn inspiration from the exciting and diverse cuisine of Inperial Beijing. As Imperial government officials usually brought their own regional chefs to the capital, Beijing cuisine is influenced by culinary traditions from all over China. When the Forbidden City was ruled by Mongols, a civic restructure brought with it hutongs (alleys), and an explosion of hawker markets. The Northern Cantina menu features many hawker cuisine favourites. 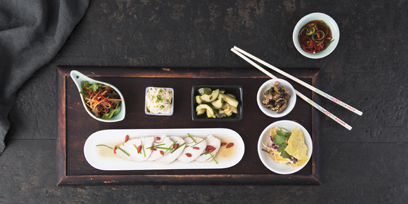 The Qantas Garden Bar, Southern and Northern terraces offer traditional Chinese street snack favourites, including delicious steamed buns known as bao. The Platinum Club explores a range of tastes, textures and cooking techniques from Beijing, while the buffet availalbel at the Platinum Club Bar features a range of hot and cold Chinese salads, appetisers and finger foods. What’s the difference between Northern Chinese food and the Chinese food I get at my local neighbourhood restaurant? Northern Chinese cuisine is influenced by the extreme cold and dry winters and very hot summers, which meant all food traditionally needed to replenish calories and salt. Vegetable crops could not be cultivated as easily as other parts of China, due to the harsh climate, so all vegetables and fruits were preserved either by drying or pickling; hence the prevalence of chillies, pickles, oil, dried foods. Low rainfall means wheat products are more popular than rice, so the cuisine features dumplings, noodles, steamed buns and pancakes as a starch alternative. Meats and seafood are staples of Northern Chinese cuisine. The typical cooking methods of Northern Chinese cuisine are stewing, roasting, stir-frying and deep-frying. Slow braised meat dishes are the most popular dishes in Northern Chinese restaurants. In your local neighbourhood restaurant, chances are they will feature a couple of Northern Chinese dishes (Peking duck, pork buns), but the majority of restaurants focus on the most popular dishes found in Eastern Chinese cuisine, including Cantonese (dim sum, seafood), and Fujian (soups, sweet and sour dishes).